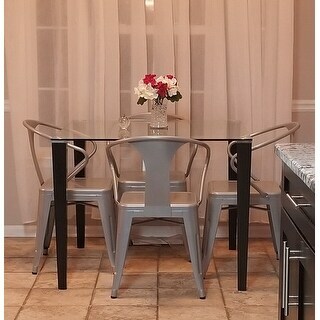 I needed some chairs to go around a glass table in my kitchen nook and these chairs were a very nice addition. They are comfortable and easy to move around despite being a heavy grade metal. It was also a real bonus that they are stackable. Create the perfect breakfast nook or enjoy additional seating with this set of four stacking chairs. Whether you use these chairs daily or just for special occasions, their unique stacking design makes them easy to store when not in use. 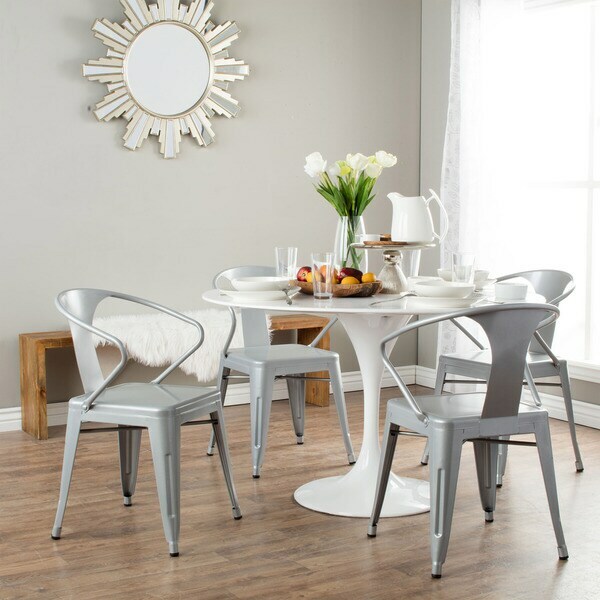 Made from durable steel in a versatile silver finish, these metal chairs are sleek and chic. Purchased four of these chairs because my small children had virtually destroyed our wooden chairs. I had previously purchased the counter height stools & been very pleased. We have been using the chairs about 2 weeks. They arrived no problem, no scratches or dents (despite a huge rip in the box). I pulled them out of the box ready to use. The kids have managed to tip; them with effort, & my smallest (3) has managed to fall out the side (on purpose) but overall these have been a great choice for us. The bases work well on our hardwood floors & they wipe down great (the seam at the back can get crumbs, but hasn't been difficult to clean). 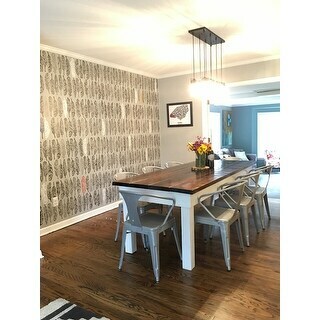 Decor wise, we paired them with an older wooden table & brushed nickel lighting. They definitely have a modern cafe type feel, & make the room feel more open.... Another poster mentioned they don't slide up under the table which I was concerned about, but I found they don't take up much more room than my previous chairs. Regarding fitting.... I have had a pretty heavy set guest use them for one meal, & I noticed she just sat forward in her chair with no problems. blends with our contemporary Southwestern decor (chose the silver metallic color) and think theyd complement any decor. The chairs store easily as they stack and dont have a huge footprint. Chair back is comfortable even though it is not high. Dont know where the folks were coming from who said the seat area was tight (fitting up to a size 12 rear end) with the curved back bar that meets the seat. I guess a very heavy person would have a problem, but my 6 ft./2 in., 210 lb. husband has NO trouble sitting in the chair. The chair is not deepabout 15 inches, but doubt anyone will be sitting in them for long periods. Ordered these on a Thursday evening; they arrived the following Tuesday! Cant get much better than that! The packaging was superb! These babies did not wiggle in shipment and were wrapped and protected in every way. We are extremely pleased! It's difficult to give a starred review on this one. Loved the chairs themselves. Great look and high quality. Minor blemishes occurred in shipping, however, which was a bit disappointing. HOWEVER, Overstock was simply wonderful about the return. One caveat to the chairs, though. If your behind (or your expected guests' behinds) are any wider than a ladies' size 12....beware. Because of the arms, the width of the seat is limited. Overall, some great chairs. They feel like they're sturdy and made well - not just some flimsy metal chairs. The finish is a little bit more of a dull grey - so it's not a bright-ish silver, if that's what you're looking for. They're simple though, and pretty cool looking. First weekend we had them, we had a BBQ and got a lot of compliments on them. We're also using them for outdoor seating, and haven't had an issue with it. Who knows though, maybe after a few months the paint will start to come off since it says they're for indoor use only... so far so good though. And hey - 4 cool looking, sturdy chairs for this price? Was worth it in my opinion. Overall, we like them so far. We own the tabouret stacking chairs, the tabouret stools, the tabouret bar stools (perforated and non-perforated styles). We use this furniture in our house, our offices, and our weekend farm home. These chairs are very high quality, stack easily, and look great. We are currently using ours with a reclaimed barnwood table. I feel great about the purchase and would recommend to anyone. I have been looking for chairs like this for a year! They are so similar to other French cafe chairs, who will remain nameless, but for a fraction of the price! Just 1 of the other chairs would have cost about as much as 8 of these!!! I am still in shock at the value of these! I plan to use them outside, so will most likely have to spray them with some kind of protective coat, as they say for indoor use only, but they look very well made and so sturdy, I do not anticipate any problems. They do not however look like galvanized metal, so if you are looking for a more rustic look, this may not be what you are looking for. I have them around a huge farmhouse outdoor table though and they look perfect! We bought these chairs as a more affordable alternative to similar chairs from a different store, and we're actually glad we bought these because we ended up liking them better than the other ones! Yes, the finish of these chairs isn't steel-looking at all. It's a silvery, very durable-looking coating, as others have described before. When you look at the pictures and you know about the finish, you can actually see it, so we weren't surprised at all. Many other Tolix knockoffs (I didn't even know about Tolix until I looked into the chairs I originally wanted to buy - also knockoffs) have that fake-old look, and while I definitely like the industrial, used type of look, I kind of hate it when it's obviously fake. The Tabouret chairs look shiny and new, and I'm perfectly fine with that. I was worried that the black rubber feet would be wobbly or uneven or would scuff up our hardwood floors, but we've had the chairs for a few weeks and they've been great. I was also super impressed with the packaging! The delivery person left the giant package on your patio (I had left a note for him to do so), and the whole thing was upside down! But everything was packaged so well that it didn't matter at all. There was even a little wooden platform for the chairs to stand on so the legs wouldn't poke out of the package. All in all, great purchase! I am so happy I bought these chairs! I thought they might be too silver for what I was going for, but they're perfect! Every person that comes into my house asks where I got them. I'm also loving the fact that I can stack them while I'm cleaning house...or later if I want to store the other two, they are easy to stack in an extra closet. I highly recommend buying the tabouret chairs. I'm so proud of the this purchase! I almost bought the pretty much same chair at another furniture store for $100 each! These are a great quality chair and look great with the rustic wood table I purchased somewhere else! Chairs can get expensive, but this set of four made for a GREAT deal! I bought the set of four to go on each long side of the rectangular table and a two stools to go on each shorter side of the table. I love the modern rustic look that it gives my breakfast nook! We purchased the chairs for our conference room at the office to match the whole metal/wood vibe we are doing. The chairs look great, but aren't comfortable. I bought seat cushions at Target so the staff will sit in them. Also, I am a petite female and fit the chairs fine, but the chairs are too small for our over 6 ft male staff. Our experience was consistent with other reviews. Chairs were impressively packed for shipment and arrived in perfect condition. They look great in our eclectic kitchen, blending well with stainless appliances, modern white cabinetry and butcher block farmhouse style table. Their small scale is a plus for us, as it's often hard to find dining chairs that are comfortable for relatively small/short people. It took me a long time to order these but I am so glad I did. I paired them with a farm house style table and linen head chairs. a very cool farmhouse shabby chic look... so thrilled with the way it came out. these are NOT distressed the way some other stores sell them - they are a true metal/grey finish. if you are going them with linen chairs the nail heads should be silver in color as well. the price cannot be beat and i am so pleased with the entire look. if you are going for the industrial farmhouse look- these are the way to go. Also, my boyfriend was worried they would be "cold" to sit on- but they are not at all. they're quite spacious and comfy. I do not recommend a seat cover actually as I like the style as is. They looked nice on Overstock, and was looking for a modern dining chair to balance a rustic table. Ordered 8 chairs. But half the chairs arrived bent and scratched with paint already chipping off. 2 out of 4 chairs were presentable. Afraid to open the second box. 2 sets of friends have seen our new chairs and are going to purchase them now! They are that great! One came slightly damaged and Overstock has blown me away with their resolution process. I am crazy about this purchase and buying bar stools to match. Fabulous! Thank you! The main picture for this does not depict how bland these chairs look. Basically they look like the 2nd picture without the texture. These chairs look awful. The silver is painted on. 2 things that happened with these chairs. 1 chair was already chipped exposing the original metal (not sure what type of metal it is). Another chair's back is starting to split apart. Not sure what I'm going to do with these. I might need to spray paint them so they look a bit textured or something. These chairs held up well to thicker folks. They have held people over 250 pounds without a problem. We use these chairs for parties and large family gatherings! Really love these chairs. I have them outside and they have held up well in all weather. Easy to stack and easy to clean. Always get compliments. Love these chairs. They are sturdy, surprisingly comfortable, affordable, and went well with our industrial farmhouse look for our kitchen along with a wooden table. Would recommend! We’ve had chairs in lots different places and we them! The quality is great and it has held up really well! The look just like the picture so as long as that fits your style, go for It! Love these chairs...Just purchased matching stools. These chairs had the industrial look I was looking for but they’re much smaller/more narrow than I expected so I ended up not using them as side dining chairs like I planned but I kept them as extra seating for holidays/get together. It’s convenient how easily they stack for storage. Cute chairs, not super comfy but they work well for outdoor seating and casual indoor seating. sturdy construction. We bought two sets of these and are obsessed. They are sturdy and most importantly easy to clean! Which was a must since we have two young children that spill and can make messes. Definitely would buy again! We have had for a few years now and all still in perfect shape! "Under "Features", the Finish is listed as "Powder Coated". In the bullets in the Description, the Finish is listed as "Polished Silver". Are the chairs first powder coated, and then polished to make them look more shiny? Is one finish listed in error, and if so, which one is correct? Or please explain how both finishes are correct." I bought these chairs and love them. Yes, the silver is shiny. Powder coating refers to the technique used to apply finish and not the luster of the finished product. These chairs are great , comfortable too, they are light grey , not too shiny, just the right amount to be elegant , I bought the white round table also, the dining corner looks great! "Is the mirror in the photo available for sale?" Unfortunately we do not have the mirror pictured. "What table is pictured with these silver tabouret stacking chairs (4). LOVE it and can't seem to locate it on your site..."
Please see ITEM# 17816650 and ITEM# 16692758 for similar tables to the item in the photo. "Would these chairs match the Raymond table you offer?" Hello nessa73, yes, these chairs could match the Raymond table. Have a great day! "what chair cushions do you recommend for these? I'd prefer ones without ties"
Hello jrm, this will use a cushion that is approximately 14 x 14. Thanks for shopping with us! "What is the difference between the silver shade and the gunmetal shade. In the pictures they look fairly similar. I am trying to match up with a zinc-metal top table." Hello Alene G., the gunmetal are definitely darker. Please let us know if you have any further questions. "Hi, I'd like to order 6 of these chairs but am only seeing sets of 4. How buy two more of these same chairs? I want them to all match and do not see sets of 2." Hello theartbakery, unfortunately, these chairs are only offered in sets of four within our inventory. Please let us know if you have additional questions. Thanks for shopping with us. Give your dining area a look that exudes a wholly unique style and personality with a mismatched assortment of dining chairs. This trendy design technique provides visual interest that simply can't be matched by matching chairs. Whether you're looking to mix it up love the look of a uniform set, we have the best tips to guide you through the popular dining chair types. How to Refinish Dining Room Chairs from Overstock.com. Our guides provide customers with information about how to refinish dining room chairs.